Total Score: 8.25 - EDITOR'S CHOICE! 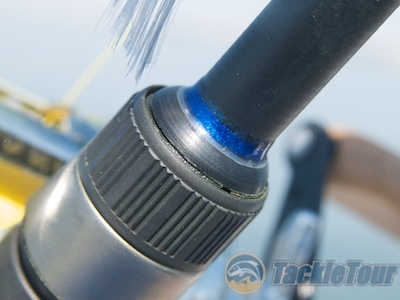 Introduction: There are several manufacturers that work closely with us here at TackleTour always up for the challenge of having their product reviewed and never shy to field critical comments and opinions. Of course, there are also those who vacate their booths as soon as we show up at any of the trade shows. Rod manufacturers in particular stand the most to gain (or lose) through our extended field tests but the journey from when we receive the product to when an actual review is published can be a lengthy one. The more a product excites us, the more we are motivated to fish it, the sooner we’re able to share our experiences. 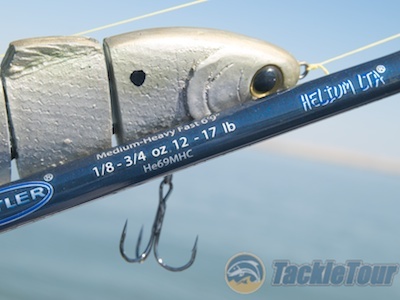 Just like any product you might find in your local tackle store racks, a piece of tackle that stands out (and stands out in a good way) stands the best chance for a timely review. Kistler Custom Rods was one of the first manufacturers to work with us directly in our premiere review of their product (the 6’6” Mark Tyler Signature Rod) published back in March of 2002, and since that time we’ve averaged at least one article per year about their company or product including one of our most widely known reviews – that of Kistler’s Helium LTA He69APC published in March of 2003. 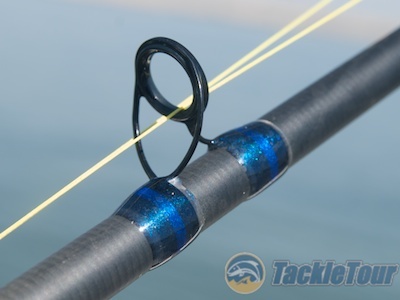 While they have, for years, been building stock rods with custom rod features what some people fail to realize is Kistler Rods has been one of the few rod manufacturers you can call or email to have your rod built with actual custom specifications. The accessibility of this company and its owner and CEO, Trey Kistler, together with the aggressive design of their product, and their receptiveness to critical assessments has been for us, what sets them apart from the masses. Those fabulous blue Zirconia inserts that helped make the rod standout have been replaced by Fuji Alconites - arguably a better guide, but we miss the blue! Our original intent for this company’s The Search For One entry was the current incarnation of their signature rod, the He69APC now renamed to the He69MHC. As you may recall, our original review of this stick praised the then, unique no foregrip design, light weight, and super responsive tip. 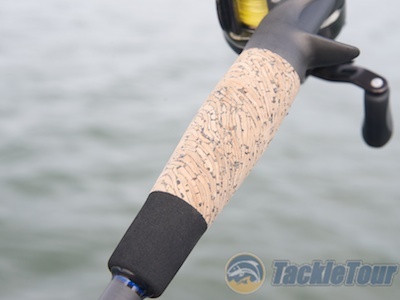 Time has caught up with this stick with just about every rod manufacturer building product with similar or even further progressed grip designs. 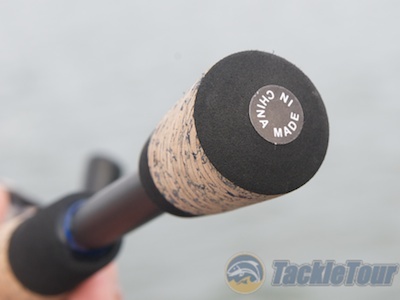 Changes in blank suppliers has diluted the unique feel of this rod’s blank as well. In short, the Helium LTA He69MHC while still a nice stick, is no longer as unique and extraordinary as the original vintage, but there’s something new from Kistler and very worthy of attention. Fig 1: This chart illustrates the deflection characteristics of the original 2003 He69APC (orange) versus that of the 2010 He69MHC (yellow) together against the TSFO baseline GLX2000 (blue). The original He69APC's unique feel can probably be attributed to the fact it was closer to a medium powered stick than a traditional Medium Heavy. Earlier this year, we kicked off our review season with a trip to Falcon Lake, Texas where Trey Kistler was on hand to meet us and show us first hand, their latest product to help keep them half a step ahead of the competition. Two years in the research and development process, and with the help of Gary Loomis’s new blank manufacturing venture, North Fork Composites, Kistler Custom Rod’s ZBone build to order fishing rods are out on the market replacing the buzz that was once inspired by the Helium LTA He69APC. Presenting our long awaited review of the ZBone LE. Lure Wt. 1/4 - 1oz. Due to a delay in software development, our custom ZBone entry to the Search For One all purpose rod shootout was ordered through several email correspondences instead of through Kistler’s web application, but at about the end of Q1 of 2010 Kistler’s Build Your Own Zbone Rod web interface was complete. It’s a pretty simple yet sophisticated interface guiding customers through the selection process and providing a component by component approximation of what the final build will look like through an image mockup at the top of the screen. The options shown through the interface at the time you place your order represent what is actually available and in stock at that time, so there is no waiting period for the procurement of parts. At the most basic end of the spectrum, a ZBone LE blank ($250) built with a standard full cork rear grip (+$5), no foregrip ($0), no hook hangar ($0), Fuji ECS reel seat (+$5), Fuji Alconite guides (+$30), standard thread wrap (+$25), and standard build time (4 weeks) will run $315. As you add or change items from this most basic of specifications, the price increases incrementally with the most impact on price coming from your selection of the grip (e.g. the Kistler LE Handle kit is $125), ZBone balancing kit (+$50), and guides (ranging from $30 - $100). The Helium LTA series now features a split rear grip along with the original no foregrip design. The He69MHC also comes with an unusually short handle (8"). What were the specifications on our Search For One ZBone stick? 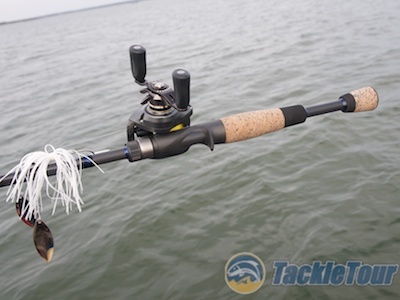 We wanted a 6’10” rod built on the LE blank with Fuji K Series micro guides with SiC inserts, rated from one quarter to about an ounce in lure weight, the ability to handle 55lb to 80lb braid, a 10” rear handle built out of the Kistler ZBone handle and balancing kit, and a Fuji ACS reel seat. Kistler advertises two to four weeks for your rod to be shipped. Wait time for our build once the word “go” was issued was about three weeks to our door. Cost for our build was $500. A closer look reveals a grip made of composite cork material mixed with a rear portion of dense foam. Certainly the wait for this stick over a standard built rod was lengthy. There’s no competing with the immediate gratification benefit of a spec rod available at your local tackle store. Obviously where the ZBone competes in time for delivery is with other custom builders. The simple fact that Kistler’s buying power as a major rod manufacturer allows them the freedom to order in bulk and have parts ready on hand to begin your build almost at the same moment you select “submit” is invaluable. And the mystery many have been wondering about... yes, the Helium series are now all made overseas.